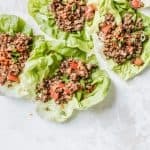 These Asian Tempeh Lettuce Wraps are a simple and healthy meal, perfect for any night of the week! Vegan, gluten-free, clean-eating. Add sesame oil to large skillet, cook onion & garlic over medium/high heat until fragrant, about 5 minutes. Add bell pepper, mushrooms, and marinated tempeh, cook for about 10 minutes, until veggies are soft and tempeh is lightly browned. Stir in hoisin sauce and let simmer for about 5 more minutes. Serve tempeh mixture in lettuce wraps, enjoy! -Store leftovers in fridge 3-5 days. Prep time does not include marinating the tempeh. This step CAN be skipped, but I find it adds much more flavor.